Today's telecommunications enable people to do business almost anywhere in the world from a single location. However, doing business successfully requires more. One obstacle still remains... the language barrier. 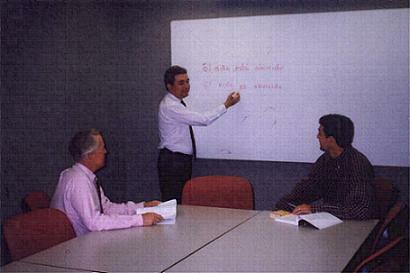 Communicating effectively in Spanish is a key element for successfully reaching the Spanish speaking world. The answer...Spanish Lessons. Spanish lessons conveniently offered in your office or home in the Dallas/Ft. Worth, TX area. Please call us at 469-767-1615 or email us a request form for Spanish lessons rates and special promotions, or visit our website www.spanishmaster.com for more information.